Growing tomatoes in a moist climate is difficult, as most tomatoes prefer fairly dry weather. If raising tomatoes has been an exercise in frustration, you may have better luck growing Florasette tomatoes. Read on to learn how. Florasette tomato plants, also known as hot-set or heat-set tomatoes, were originally bred for greater heat tolerance, which makes them a great choice for hot or humid climates. They are also resistant to common tomato diseases, including fusarium wilt, tomato spotted wilt virus and verticillium wilt. Nematodes also tend to steer clear of Florasette tomatoes. Florasette tomato plants are determinate, which means they will stop growing at maturity and fruit will ripen all at once. When it comes to flavor, Florasette tomatoes are versatile, but best eaten fresh. When growing Florasette tomatoes, install supportive stakes, cages or trellises at planting time. Tomatoes require at least six to eight hours of sunlight per day. However, if your climate is extremely hot, Florasette tomato plants will perform best with a little afternoon shade. Mulch the soil around Florasette tomato plants to conserve moisture, keep the soil warm, deter growth of weeds and prevent water from splashing on the leaves. Mulch is especially important in hot climates, so be sure to replenish it as it decomposes. Water Florasette tomato plants with a soaker hose or drip irrigation system. Avoid overhead watering, as wet leaves are more susceptible to tomato diseases. Water regularly, especially if you live in a climate where temperatures exceed 90 F. (32 C.) However, avoid watering excessively, as too much moisture may cause splitting, and also tends to dilute the flavor of the fruit. Withhold fertilizer during extremely hot weather; too much fertilizer can weaken plants and make them more vulnerable to damage by pests and disease. Prune Florasette tomato plants as needed to remove suckers and improve air circulation around the plant. 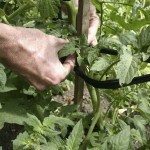 Pruning also encourages more tomatoes to develop on the upper part of the plant. If the weather is hot at harvest time, pick Florasette tomatoes when they’re still slightly orange, then let them finish ripening in a shady spot.